Rio EP Offshore Superboat kit. Now with 2.4 GHz Tactic surface radio! The Revolution® Roguewave™ 10-inch self-righting F1 tunnel hull is a quick, nimble and durable electric boat that is perfect for pools or small ponds, and Ready-To-Run right out of the box. The impact resistant hull houses waterproof electronics like the speed control, steering servo and 2.4GHz receiver while the rechargeable battery offers zippy performance and good run times. But the awesome benefit of this boat is that you'll never have to worry about capsizing. The Roguewave tunnel hull is designed with self-righting capability so it always flips upright no matter how much wake you make. The Roguewave F1 Tunnel Hull is factory assembled and Ready-To-Run, right out of the box. Inside the box you will find a 2.4GHz transmitter that features proportional control and control trims. The Lithium-Ion boat battery offers good run times and is rechargeable with the included USB charger that works conveniently with any standard USB port. There's nothing extra you need to buy. Even the AA batteries for the transmitter are included. 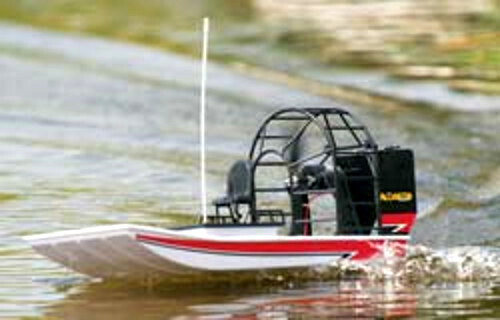 The Roguewave F1 Tunnel Hull is perfect for any beginner who wants a great start in the world of RC boating. The easy-to-drive design is complemented with confidence inspiring self-righting capability that helps keep the boat upright, even if it capsizes. The impact-resistant hull makes bumps and crashes uneventful, while waterproof electronics let you splash away worry-free.